ATS Acoustic Bass Traps are constructed with an open back and offer a choice of either Full-Range absorption or Low-Range absorption. 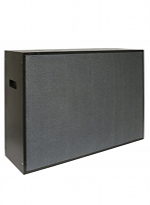 Our Full-Range bass traps help absorb all frequency ranges. The Low-Range bass traps include a reflective membrane between the insulation and fabric. This membrane helps reflect high frequency sounds. Dimensions: 24" x 36" x 4"
The core material is Roxul AFB mineral wool, a highly effective sound absorber. Available in both our original and microsuede cover fabric. Installation: The open back panels are most commonly mounted across a corner, allowing for the absorption of lower frequencies in the back of the panel. Currently ships within: 5 - 7 business days. The Corner Installation Hardware will mount the bass trap across a corner, allowing for an air gap behind the bass trap, and enhancing low-frequency absorption. Standard Hardware will mount the bass trap flush against the wall, which we don’t recommend for most bass trap applications. Different core materials? Fabric colors to match your decor? Special sizes or shapes? You name it! Just give us a call toll-free at 1-866-787-7881. I’m loving these 24x48x2 microsuede. 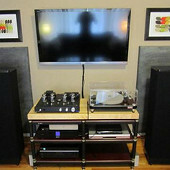 No reflections from my Vandersteen 2ce Sig II’s whatsoever! Thanks guys!